At 4 years old, Grala got his first kart – a CRG Bambino with a 50cc Comer engine, which he raced at the F1-Outdoors road course in Massachusetts. At 7 he started racing year-round at F1-Boston, a multi-track indoor road racing facility also in Massachusetts. He accumulated over 100 wins and 2 championships. At 10 he started racing Bandolero cars in Charlotte NC. This was his introduction to oval racing. He won multiple championships (oval and road course) including the most prestigious Summer Shootout at Charlotte Motor Speedway. At 12 Grala moved up to Legend cars. In 2012 alone, he won 15 of 58 races. Those wins came at 7 different race tracks, both ovals and road courses. He ended his Legends career by winning the Winter Heat Championship at Charlotte Motor Speedway in the highest and age-unlimited Pro Division. Grala kicked off 2013 as the youngest NASCAR driver ever to compete at Daytona International Speedway. At 14 years and 51 days old he started his first ever race in a Late Model stock car at the inaugural Battle at the Beach. On June 22, 2013 Grala won his first Late Model race at Hickory Motor Speedway – becoming the youngest winner in UARA series history. With 2014 hardly started, Grala is already in the news again. During the Rolex 24 at Daytona International Speedway, and at only 15 years and 26 days old, he became the youngest driver ever to compete in an IMSA/Grand-Am sanctioned event. He not only competed in, but finished 4th out of 68 cars in the CTSC BMW Performance 200 – and in his stint, set the fastest lap of the race. For the remainder of the 2014 season he will be competing full time in the NASCAR K&N Pro Series East with Turner Scott Motorsports. He will be running for not only Rookie of the Year honors but also for the series championship in the #31 Chevy Impala. Many drivers claim to have racing in their blood, but for 22-year-old Ben Kennedy, driver of the No. 31 Chevrolet Silverado for Turner Scott Motorsports, it couldn’t be more true. The great grandson of NASCAR founder and racing visionary William France Sr., Kennedy’s roots go back three generations to the very heart of the sport. Beginning his racing career in quarter-midgets in 2006, the young racer later graduated to full-sized stock trucks with crate engines in 2008. Racing on the short tracks of central Florida, Kennedy went on to win Pro-Truck championship titles at both Orlando Speedworld and New Smyrna Speedway in 2009. He followed up his two-championship season by winning the Super Late Model championship at Orlando Speedworld and Rookie of the Year honors in the Bright House Challenge Series in 2010. Kennedy made his touring series debut in the NASCAR K&N Pro Series East (NKNPSE) in 2010 before entering the series full time in 2011. In 2012, Kennedy made history when he competed in the first NASCAR-sanctioned Euro Racecar Series event, winning the event at Tours Speedway, the first NASCAR race held on an oval in Europe. Kennedy experienced his most successful NKNPSE season to date in 2013, finishing fourth in the Driver Point Standings on the strength of two wins, one pole, three top fives and nine top 10s in addition to being crowned as the series’ Most Popular Driver. He was also named by FoxSports.com as one of the drivers under 25 to watch and was selected for the NASCAR Next program in 2013, an initiative to spotlight the sport’s up-and-coming stars. Kennedy made his Turner Scott Motorsports debut in the NASCAR Camping World Truck Series (NCWTS) at Bristol Motor Speedway in August of 2013, running a total of five events and earning a best finish of fourth at Martinsville Speedway in the fall. The Daytona Beach, Fla. native is completing the final semester of his Sports Management degree at the University of Florida while vying for the Rookie of the Year title in his first full-time NCWTS effort. Despite being only 18 years old, Dylan Kwasniewski is one of the youngest and brightest up-and-coming stars in NASCAR. Kwasniewski jumped into the seat of his first kart in Norwalk, Conn. at the age of four. He quickly grabbed his first win and was hooked on racing. After moving up the ranks from go karts to bandolero to legend cars, Kwasniewski began racing in the ASA Speed Truck Series in 2009. In 2010, the young driver started racing a limited late model car and the Lucas Oil / Rockstar Modified Series before making the transition to NASCAR. Winning two races and two poles in 2011, Kwasniewski captured the Sunoco Rookie of the Year title in the NASCAR K&N Pro Series West, racing for Gene Price Motorsports. He became the youngest driver to win a race and a pole with his sweep at Colorado at just 16 years old and was highlighted as one of the top-nine young talents to watch in NASCAR. In 2012, Kwasniewski returned to Gene Price Motorsports for the full 15-race NASCAR K&N Pro Series West schedule. Again he was named one of NASCAR’s Next9 as he scored three wins, six poles, 12 top fives, and 15 top 10s en route to his first NASCAR championship. After becoming the youngest driver to win the NASCAR K&N Pro Series West championship in 2012, Kwasniewski moved on to the NASCAR K&N Pro Series East with Turner Scott Motorsports (TSM) in 2013. Kwasniewski followed up his stellar 2012 season with another year for the record books. He scored six wins, three poles, nine top fives and 12 top 10s in 14 races to earn the K&N Pro Series East championship, becoming the first driver in NASCAR history to win both the East and West championships. His record-setting year was highlighted on Flat Out, a documentary for AOL. The 11-episode miniseries can be viewed at www.flatoutdk.com. This season, the 18-year-old sets his sights on the NASCAR Nationwide Series. Kwasniewski will return to TSM and pilot the No. 31 Rockstar Chevrolet Camaro, vying for the coveted Sunoco Rookie of the Year award and seeking his third-straight championship. LAS VEGAS (September 28, 2014) – In his third-career NASCAR Camping World Truck Series (NCWTS) start at Las Vegas Motor Speedway (LVMS), Tayler Malsam and his Turner Scott Motorsports (TSM) team had impressive speed throughout the action-packed one-day show, allowing Malsam to score a career-best qualifying position as well as a career-best LVMS finish of ninth at the 1.5-mile track. Starting the 146-lap race from the third position, the No. 32 Outerwall Chevrolet Silverado became aero tight shortly after the green flag waved, causing Malsam to lose several track positions before the first caution flag waved on lap three. Dropping additional spots after the restart, Malsam told crew chief Mike Hillman Jr. that it felt like his right-rear tire was going down. Although the Outerwall Chevy continued to fall back, Malsam wheeled the machine to the best of his ability until the second caution arose on lap 15. Hillman was forced to change his strategy as he called Malsam to pit road to inspect the Silverado; after a thorough look, it was determined that a dirty grille was to blame for the extreme loose conditions of the truck. Taking four new tires and fuel, along with track-bar and wedge adjustments, Malsam rejoined the field just outside the top 20. The scheduled competition caution flag waved on lap 32 and Malsam returned to pit road for two right-side tires and fuel. Continuing to deal with loose handling conditions due to the dirty air, the TSM team helped Malsam gain 11 positions after the quick pit stop, placing the No. 32 Outerwall Chevy in the eighth spot for the restart. By lap 50, Malsam began running lap times as good as the leader. The third caution arose on lap 57 and Hillman called the No. 32 truck back to pit road for four tires, fuel and an air-pressure adjustment. Following the restart, Malsam continued to run consistent lap times with the leader and settled into the top 10 until green-flag pit stops began. Coming to pit road for a quick four-tire stop on lap 108, Malsam rejoined the field outside of the top 10 and began working his way through traffic. Only taking 10 laps for the No. 32 Outerwall Chevy to charge back into the top 10, Malsam was able to maintain position in the final 20 laps to score a ninth-place finish in Sin City. In addition to scoring his career-best finish at the Las Vegas track, this marks Malsam and his TSM team’s fourth top-10 finish in eight NCWTS starts this season. 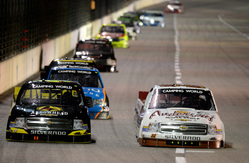 Heading to Kansas City…The NASCAR Nationwide Series (NNS) will make its first and only trip of the 2014 season to Kansas Speedway on Saturday afternoon. Dylan Kwasniewski will make his first-career NNS start at the Kansas City, Kansas track this weekend, but the 19-year-old rookie is no stranger to success at the 1.5-mile D-shaped oval, having one ARCA Racing Series start there last year where he sat on the pole and led 17 laps before finishing in the fourth position. About AccuDoc Solutions…AccuDoc Solutions is based in Morrisville, NC and provides billing-statement printing and processing to hospitals and hospital-based physicians. In addition to paper-based billing statements, ADS enables patients to choose electronic statement delivery and make payments through secure online payment portals. Notable North Carolina based clients include Carolina’s Healthcare System, the UNC Healthcare System, Sentara Healthcare, Baptist Health Care Pensacola, Wake Forest University Baptist Medical Center, Memorial Healthcare System and WakeMed. To learn more visit www.AccuDocSolutions.com. Previous Race Recap…The NNS made its second and final stop of the 2014 season at Dover International Speedway for the Dover 200 last Saturday afternoon. Kwasniewski and his No. 31 Rockstar Energy Drink team were looking for redemption and a solid finish in the young rookie’s second NNS start at the one-mile short track. After working on finding speed in both practice sessions on Friday afternoon, Kwasniewski qualified 17th in NASCAR’s knockout qualifying on Saturday morning. After fighting a tight racecar throughout the majority of the race, Kwasniewski crossed the finish line in the 21st position for Turner Scott Motorsports. Watch and Listen…The Kansas Lottery 300 can be seen live on Saturday, October 4 on ESPN. Race coverage will begin at 3:00 p.m. EDT with NASCAR Countdown, followed by the green flag dropping at 3:30 p.m. EDT. The event can also be heard live on MRN Radio as well as SiriusXM Radio, channel 90. Follow Along…Be sure to follow the No. 31 team (@PR31TSM) on Twitter for the latest news, race updates and behind-the-scenes access to Kwasniewski and his TSM team. KANSAS CITY, Kan. (October 5, 2014) – In his second-career NASCAR Nationwide Series (NNS) start at Kansas Speedway, Kyle Larson dealt with handling issues throughout the weekend. Despite a solid effort by his Turner Scott Motorsports (TSM) team, damage from a mid-race accident left Larson unable to complete the 200-lap event, relegating him to a 30th-place finish in the Kansas Lottery 300. With only one NNS practice session due to weather in the Kansas City area, Larson and his TSM team struggled to find a solid package for the No. 42 Cartwheel by Target Chevrolet to take on the 1.5-mile oval. After several adjustments following practice, Larson was able to score a ninth-place starting spot for the Cartwheel Chevy, and his TSM team felt much better about their chances to contend for the win. Shortly after the green flag waved, the track saw its first two cautions within the first 15 laps and Larson told crew chief Scott Zipadelli that his machine felt a tad loose in the opening laps. When the third caution arose on lap 22, however, the handling on the No. 42 car had drastically changed from loose to tight. Zipadelli wasted no time calling Larson to pit road for four tires, fuel and a quick adjustment. Being just one of a few competitors to take four tires on pit road, Larson rejoined the field in the 12th position and settled in until the next caution flag waved on lap 44. Zipadelli called Larson back to pit road for four tires, fuel and a track-bar adjustment to help free up his exit in Turn 4 as well as his speed through Turns 1 and 2. Still extremely tight, Zipadelli opted to take a big swing at the Cartwheel Chevy when the fifth yellow flag waved on lap 75. After taking four tires and fuel, along with track-bar, wedge and air-pressure adjustments, Larson rejoined the field in the 20th position, hoping to charge to his way to the front. After making less than 15 laps, however, Larson began to feel a slight vibration as he entered Turn 1 on lap 91. As he exited Turn 2, his Cartwheel Chevy snapped loose, sending him up into the wall at full speed. Unharmed, Larson drove his severely damaged machine to the garage for a thorough look. Despite hard work and a strong effort by the No. 42 TSM team, the Cartwheel Chevy suffered irreparable damage and was unable to return to the track for the remaining 109 laps, ultimately scored in the 30th position when the checkered flag waved. KANSAS CITY, Kan (October 5, 2014) -The NASCAR Nationwide Series (NNS) made its first and only stop of the 2014 season this weekend at Kansas Speedway for the Kansas Lottery 300. With new sponsors Valvoline and Estes on board for Saturday afternoon’s race, Dylan Kwasniewski and his No. 31 team looked for a solid finish in the young rookie’s first NNS start at the mile-and-a-half oval. After the first scheduled NNS practice was rained out on Friday morning, Kwasniewski and his team worked on finding speed in the only practice session of the weekend. After finishing 18th on the practice charts, Kwasniewski returned on Saturday morning and qualified 15th in NASCAR’s knockout qualifying session. After fighting a loose racecar and surviving multiple cautions throughout the race, Kwasniewski narrowly missed a top-10 finish, crossing the finish line in the 11th position. Following the drop of the green flag, Kwasniewski gained one spot on lap one and maintained that position until the second caution of the afternoon came out on lap 13. During the caution, Kwasniewski reported to crew chief Shannon Rursch that his Valvoline/Estes Chevy was a little loose, but overall felt pretty good. Kwasniewski restarted 14th on lap 17 and was scored in the 18th position when the third caution came out just four laps later. During the caution, Rursch called the young rookie down pit road for four tires, Sunoco Race fuel, and track-bar and wedge adjustments. Despite taking a big swing at things on pit road, Kwasniewski maintained his position and restarted 18th. Running consistent lap times, Kwasniewski worked his way up to the 16th position when the fourth caution flag came out on lap 45. Playing strategy, Rursch called Kwasniewski down pit road for a two-tire stop and fuel. Rursch’s plan paid off as Kwasniewski picked up two spots on pit road and restarted 14th on lap 50. Kwasniewski maintained his top-15 position until making a green-flag pit stop on lap 133 for four tires, fuel and one final adjustment. Once green-flag pit stops cycled through, Kwasniewski was scored in the 19th position on lap 135. Kwasniewski survived two more cautions and continued to run top-10 lap times during the final laps of the race, gaining several positions to bring the Valvoline/Estes Trucking Company Chevy home in the 11th position. Home Sweet Home…Turner Scott Motorsports (TSM) returns to its home base as the NASCAR Nationwide Series (NNS) heads to Charlotte Motor Speedway on Friday night for the Drive for the Cure 300 presented by BCBS. Dylan Kwasniewski will make his second-career NNS start at the 1.5-mile track this weekend, having finished 13th in his debut at the Concord, N.C. track in May. About F.O.E…The Fraternal Order of Eagles, an international non-profit organization, unites fraternally in the spirit of liberty, truth, justice, and equality, to make human life more desirable by lessening its ills, and by promoting peace, prosperity, gladness and hope. Founded in 1898, the Eagles fund research in areas such as diabetes, heart disease, kidney disease and cancer, and raise money for neglected and abused children and the aged, as well as work for social and civic change. Previous Recap…The NNS made its first and only stop of the 2014 season at Kansas Speedway last weekend for the Kansas Lottery 300. With new sponsors Valvoline and Estes on board for Saturday afternoon’s race, Kwasniewski and his No. 31 team looked for a solid finish in the young rookie’s first NNS start at the mile-and-a-half oval. After finishing 18th on the practice charts, Kwasniewski returned on Saturday morning and qualified 15th in NASCAR’s knockout qualifying session. After fighting a loose racecar and surviving multiple cautions throughout the race, Kwasniewski narrowly missed a top-10 finish, crossing the finish line in the 11th position. Watch and Listen…The Drive for the Cure 300 can be seen live on Friday, October 10 on ESPN2. 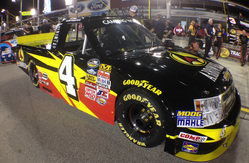 Race coverage will begin at 7:00 p.m. EDT with NASCAR Countdown, followed by the green flag dropping at 7:30 p.m. EDT. The event can also be heard live on PRN Radio as well as SiriusXM Radio, channel 90. CHARLOTTE, N.C. (October 11, 2014) – Kyle Larson and his Turner Scott Motorsports (TSM) team hoped to return to Victory Lane at Charlotte Motor Speedway after Friday night’s NASCAR Nationwide Series (NNS) race, but despite having a lightning-fast No. 42 Nature Made Chevrolet Camaro, multiple cautions proved that their machine wasn’t as strong on short runs, and they were forced to settle with a fifth-place finish when the checkered flag waved. With undeniable speed, Larson was able to lay down top-10 lap times throughout both NNS practice sessions on Thursday afternoon. The 22-year-old followed them up by advancing to the third and final round of qualifying, ultimately scoring a sixth-place starting position for the Drive for the Cure 300. Motivating Larson and the No. 42 TSM team even more, Make-A-Wish teamed up with Nature Made on their KIDS FIRST initiative and brought 17-year-old avid NASCAR fan, Christian, to the race for a top-notch experience. With Christian and his family atop the pit box, the green flag waved and the first two cautions quickly arose. 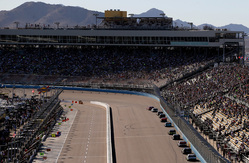 Despite telling crew chief Scott Zipadelli that his Chevy was tight, Larson was scored as the fastest car on the track several times before green-flag pit stops began to take place. On lap 60, Zipadelli called the Nature Made Chevy to pit road for four tires, fuel and a track-bar adjustment. Once again, Larson began to lay down the fastest lap times, some being a tenth faster than the field. The third caution flag waved on lap 115 and Larson told Zipadelli that he was a little too loose after the change. Zipadelli called Larson back to pit road under the next caution for four new tires and fuel, along with an adjustment to tighten up his Nature Made KIDS FIRST Chevy. Maintaining a spot within the top five after the restart, the fifth caution was quick to follow, and with Larson still loose through Turns 1 and 2, Zipadelli called him back to pit road. After four tires, fuel and an air-pressure adjustment, Larson found a top-five spot again following the restart. The yellow flag waved again on lap 167 and Larson told the crew that his Chevy was still really loose. Coming back to pit road, Zipadelli called for the final set of Goodyear tires, a splash of fuel and another air-pressure adjustment. Restarting outside of the top 10, Larson made every jaw drop when he charged his No. 42 Nature Made Chevy from 12th into third place in a matter of seconds. Despite an incredible attempt to get to the front, the caution flag waved one final time on lap 177 and Larson told Zipadelli that his car was now too tight. Unable to run the bottom, Larson dropped back to the fifth position after the final restart and maintained his position until the checkered flag waved. Larson and the No. 42 TSM team now have 13 top-five finishes throughout their 25 NNS starts this season. CONCORD, N.C (October 11, 2014) – The NASCAR Nationwide Series (NNS) made its second and final stop of the 2014 season at Charlotte Motor Speedway on Friday night for the Drive for the Cure 300. Dylan Kwasniewski and his No. 31 F.O.E team looked to continue the momentum gained in Kansas while racing at Turner Scott Motorsports’ home track. After getting a feel for the mile-and-a-half track during the first practice session on Thursday afternoon, Kwasniewski and the No. 31 team finished second practice in the 3rd position. Kwasniewski returned to the track on Friday afternoon and qualified 21st in NASCAR’s knockout qualifying session. After suffering damage on the first lap of the race, Kwasniewski continued to battle, crossing the finish line in the 14th position. As soon as the green flag dropped on the 200-lap event, Kwasniewski’s No. 31 machine suffered damage when another competitor missed a shift, causing an accordion effect that damaged nine cars and resulted in a quick caution to start the race. During the caution, crew chief Shannon Rursch called Kwasniewski down pit road to repair damage to the rear end and nose of the F.O.E Chevy. After taking time to repair the damage but staying on the lead lap, Kwasniewski restarted in the 30th position. Kwasniewski wasted no time gaining spots back as he moved up five spots by the time the second caution waved on lap 18. Under this caution, Rursch once again called Kwasniewski down pit road, this time taking four tires and fuel while making wholesale adjustments to the F.O.E. Chevy. After restarting 24th on lap 22, Kwasniewski maintained a top-20 position until green-flag pit stops started on lap 57. With other competitors coming down pit road, Kwasniewski worked his way up to the fourth position before a timely caution came out on lap 69. With only a handful of cars on the lead lap, Kwasniewski came down pit road for another pit stop, changing four tires and taking on Sunoco racing fuel before restarting fourth on lap 74. Still battling a tight racecar from the earlier damage, Kwasniewski dropped back to the 12th spot by lap 90, a position he held onto until the fifth caution came out on lap 134. After making one final pit stop, Kwasniewski continued to run solid lap times, coming home in the 14th position at the end of the 200-lap race.